Family doctors see more patients than any other specialist, but there remains confusion about exactly what "family medicine" is. This timeless discipline has experienced great change in the last 50 years, but it remains the nucleus of patient care. The PAFP has created a series of publications to reintroduce you to this evolving specialty. Most people (in Pennsylvania and the United States) rely on family physicians. Pennsylvanians value their family physicians. Family medicine is patient and community care. Family physicians are uniquely prepared to care for the "whole person." Lifelong learning keeps family doctors grounded in science and technology. The relationship is at the heart of the process. Family physicians are hands-on patient advocates. Education and research drive health care improvements. The PAFP speaks for family medicine and has an impact on public health policy, individual patient care and the many other issues important to family medicine. Click the cover to read "Who We Are and What We Do." Click the cover to read "Who We Are and What We Do." Imagine yourself as a family physician. If you're looking for easy, this isn't for you. But if you want to make a difference in people's lives, family medicine just may be the answer. Read about preparation for medical school and consideration of personality traits that best suit family medicine. Read about choosing family medicine as a career in medical school and applying to a family medicine residency program. Read about getting started in practice with license and board exams plus career path decisions. Read about a career-long commitment to excellence in health care that includes continuing medical education, license and board renewal, research and a commitment to physician citizenship. Click the cover to read "A Look at the Education of a Family Physician." What does the PAFP believe about issues facing family medicine? This issue deals with the legislative and advocative aspects of family medicine. Read about the issues, including public health, scope of practice, medical economics, medical professional liability and patient safety. Become familiar with specific policies on current legislation. Find out who to contact on what issues. What is health care reform, and what do family physicians think about the changes to the world of health care? Click the cover to read "What We Believe about Issues Facing Family Medicine." What is a "Patient-Centered Medical Home," or "PCMH" for short? This issue tells you everything you need to know about this exciting health care innovation. Read about the Patient-Centered Medical Home - how it started and how it will transform health care in America. Learn the seven principles of the PCMH. Become familiar with several organizations that chart a practice's progress to becoming a PCMH. See evidence that proves the Patient-Centered Medical Home is more cost-effective - and leads to healthier patients and happier physicians. Click the cover to read "The Patient-Centered Medical Home." Unsure about whether becoming a Patient-Centered Medical Home is right for your practice? This issue answers any questions you might have about becoming a PCMH. Learn why becoming a Patient-Centered Medical Home may be what's best for your practice - and its bottom line. Find out how a practice can become recognized or qualified as a Patient-Centered Medical Home. Meet family physicians who have made the PCMH transformation - and learn why they're so pleased with the decision. Discover how the PAFP's team of PCMH advisers will be there for you every step of the way as your practice transitions into a Patient-Centered Medical Home. 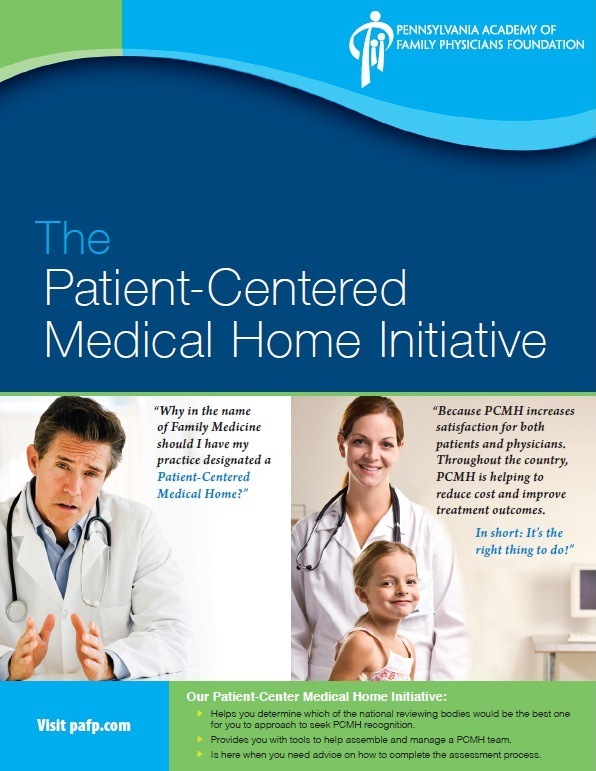 Click the cover to read "The Patient-Centered Medical Home Initiative."